Released this week on ThisIsArea7, ‘Where Did You Go’ is the debut single from London based soul singer-songwriter Shea. With a timeless sound encompassing contemporary themes of abandonment, Shea’s single brings together classic soul and jazz influences in a classy and heartfelt lament. Produced by Drew Horley (best known as the producer of Ty’s Mercury Nominated album ‘Upwards’), ‘Where Did You Go’ evokes smoky jazz clubs, and puts a new twist on an era where double bass and snare brushes ruled the live circuit. It showcases one side of Shea’s multifaceted, self-penned debut album, due for release in 2013. 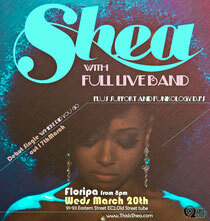 Get down to Floripa in London tonight to see her perform live, it should be a good one.